All my life, I have been forced to feel like I had to defend myself and my quiet behavior. People always use an accusive tone, whenever they tell me I am shy, and they always tend to talk about it, as if it's a fault I need to correct. And the thing is, I have long been accustomed to agree with them. This is why "Quiet" was such a revelation for me. 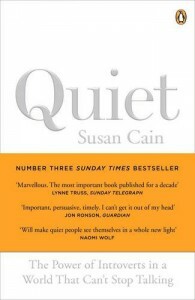 Cain managed to persuade me that it's perfectly okay to be an introvert, and that it is, in fact, not as unusual as society seem to make us think. While this was a tough and hard book to read (due to all the references to neuropsychology and behaviourism), it was rather reassuring and comforting. And I think it changed a little part of me - not in a significant or life-altering way, but in a small and inner perspective. Sometimes it's just nice to know that you're not alone; even if people tend to regard you as a loner.